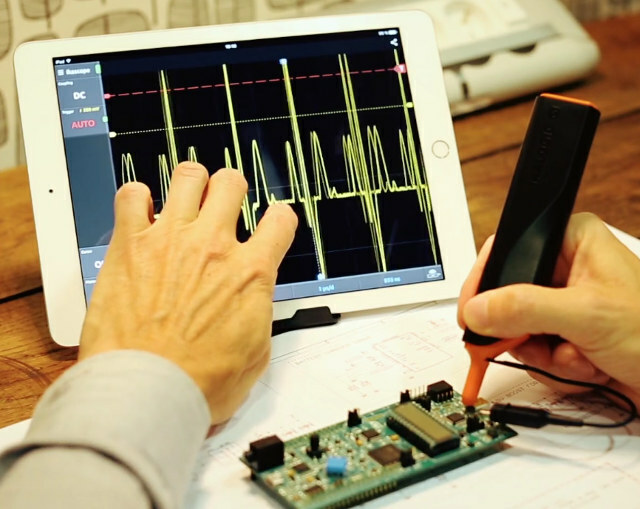 Last year, I wrote about Aeroscope, a portable Bluetooth oscilloscope that looks somewhat like a Stabilo Boss highlighter pen, and sends measurements over the air directly to your Android and iOS tablet or smartphone. It was introduced through a crowdfunding campaign which eventually failed, but Aeroscope can now be purchased for $199 on Amazon US or their own website. 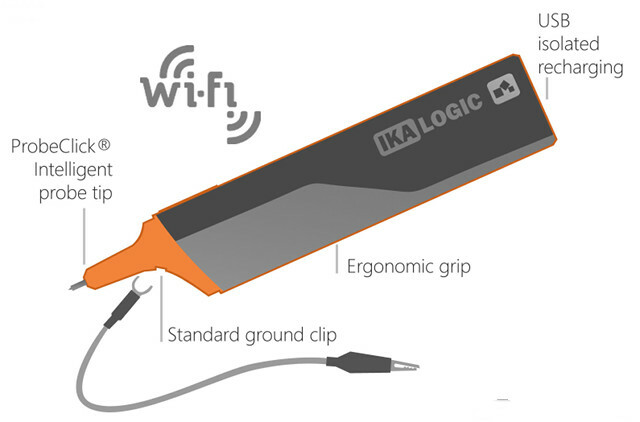 If you’d prefer WiFi over Bluetooth, and would like something that also works on Windows, Linux, and/or Mac OS X, IKALOGIC has just launched IkaScope WiFi oscilloscope probe compatible with all popular mobile and desktop operating systems. Battery – 420 mAh battery good for about 1 week battery life with daily regular use. IkaScope specifications are slightly better than the ones of Aeroscope when it comes with analog bandwidth and sample rate for example, but the battery capacity is lower. However, the latter is likely more than compensated by ProbeClick technology that will only measure when a contact is detected, hence saving power during idle times. One advantage of WiFi over Bluetooth is that it allows for a higher refresh rate up to 250 fps. The probe ships with a ground clip and a USB charging cable. OS support will be brought step by step starting with Windows, but Linux, Mac OS X, iOS, and Android will all be supported by November 9th if the schedule’s deadlines can be met, and all desktop OK will be supported by the end of September before shipping. More details about the software can be found in IkaScope knowledge base. IKALOGIC has started taking pre-order for IkaScope for 299 Euros excluding VAT and shipping scheduled by the end of the year. “EARLYBIRD” coupon valid until the 20th of September will power the price by 10%.. Some more information, and the purchase link are available on the product page. They use their own software based on the info in the wiki, but maybe that’s something they should think of. For 200 dollar, you already get an oscilloscope with 200 Mhz and 1 G Sample rate. Also with multiple channels. They also often have USB. Perhaps you could get a supplier to send you a recent diy kit to build and test, or a guest post? I’d like an oscilloscope stick like the one if the post… I could not find any. More like 400$, but it’s a complete scope, with 4 probes, USB and ethernet!